Is There a Difference Between Early and Late Endoscopic Balloon Dilation for Gastrojejunal Stricture After Roux-en-Y Gastric Bypass? Endoscopic balloon dilation has been shown to be an effective treatment for gastrojejunal (GJ) strictures after Roux-en-Y gastric bypass (RYGB). We hypothesize the number of necessary interventions is influenced by the time interval since RYGB. This is a retrospective review examining the relationship between the interval from RYGB to balloon dilation in patients with stricture. Records between July 2006 and September 2008 of patients who underwent upper endoscopy (UE) after RYGB were retrospectively reviewed. A non-consecutive series of 466 symptomatic morbidly obese patients were evaluated using UE. The endoscopic findings for this cohort was extracted directly from the patients’ original endoscopy report, classified, and recorded. Of the 466 patients who underwent UE after RYGB 74% had symptoms which resulted in 53 patients with stricture. Patients were divided into three groups based on their interval from RYGB to initial balloon dilation (group 1; 0 to 120 days from RYGB, group 2; 121 days to 365 days, and group 3 greater than 1 year). Strictures were dilated using controlled radial expansion balloons up to 20mm. There were no perforations or clinically significant complications at the time of dilation. 97% of early strictures resolved with balloon dilation; however, only 79% of late strictures were resolved with balloon dilation. Early strictures are more likely to be resolved with balloon dilation. However, late strictures are less likely to be resolved with repeated balloon dilations and are more likely to result in revisional surgery. 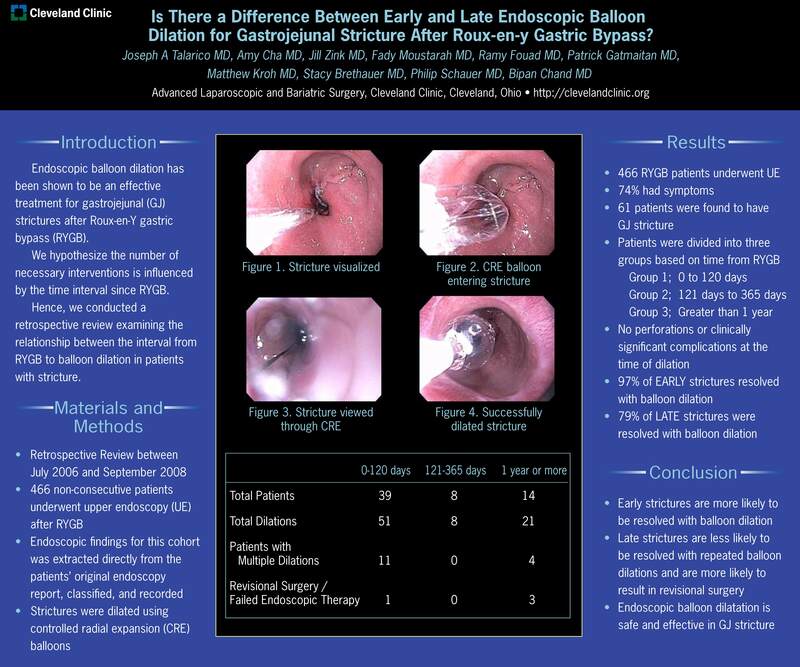 Endoscopic balloon dilatation is safe and effective in GJ stricture.